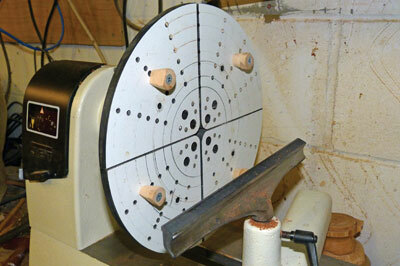 Chris latest homemade jig is a reversing Cole-type backplate, which enables him to clean up the bottoms of bowls, etc. Having previously worked as a mechanical/electrical engineer all his working life, Chris was used to the metal turning lathe. It wasn’t long after seeing a programme on pen turning on the Discovery Channel that Chris was enthralled by the thought of woodturning. 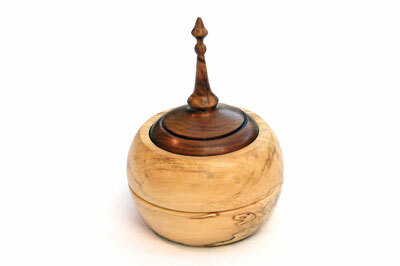 After seeing the Discovery Channel programme, the thought of turning a small pen on a woodturning lathe appealed to me. I bought a small lathe and after my first attempts at making pens, I wanted to know more about woodturning and I was hooked. After a few years of working on my own, I attended a demo day at my local Axminster Store and there were a few woodturning clubs doing demonstrations and having spoken to some of the turners, I joined my first club, Orchard Woodturners. The greatest influences on my work are watching the demonstrations both professional and amateur at my local clubs - Orchard Woodturning Club&Medway Woodturning Association - and, of course, reading Woodturning magazine. I am not a very artistic person normally, so seeing items turned by other woodturners has been the driving force for me to try and make something different for the monthly competitions at the clubs. 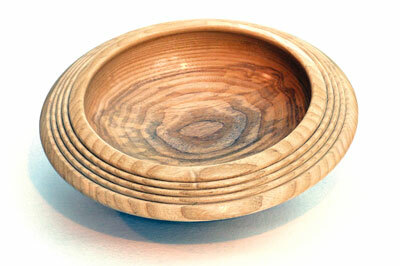 My one piece of advice to anybody wishing to start woodturning is to attend a good course with a registered turning instructor. This will hopefully lay the foundation to help prevent mishaps in the workshop. I attended a course with Dave Bates of Stiles&Bates. He is a natural teacher and really funny as well. 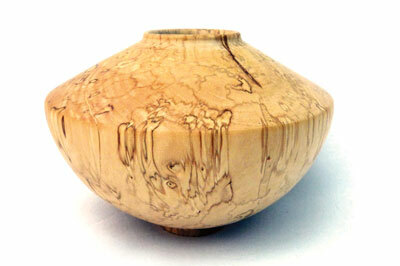 Joining a local woodturning club is the best advice I can give - I love the camaraderie of the members. Being a teenager in the 60s, I prefer rock music - Led Zeppelin, Nazareth, etc. - and quite a bit of the new type of music as well as some classical. As for books, I read mainly thrillers. My daughter bought me a Kindle for Christmas and the world of books has really opened up for me. 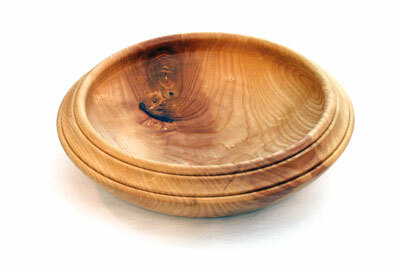 My favourite authors include Clive Cussler, Lee Child and Andy Remic, and of course Woodturning magazine! Where to start! I’ve made a few, but not concentrating and going through either the side or the bottom of my turned items is something I am still prone to. Having come from a high pressure work environment where everything is done quickly, my biggest challenge is making myself slow down and take my time. Too often I rush and am disappointed with the end result. As I am retired, I have no need to rush now so I need to calm down. I have become very interested in textured surfaces, hollowing and segmenting. I will be attending a hollowing course soon with Mark Sanger and hope to come back with more confidence to produce some hollowed items. I would also like to further my knowledge of texturing and colouring. Which piece are you currently working on? I’m not currently working on anything special, but my last project was a piece which I have called ‘Marbellous’. It is very different from my usual items having got some 'artistic' ideas from the fancy sideboard decorations that my wife bought. 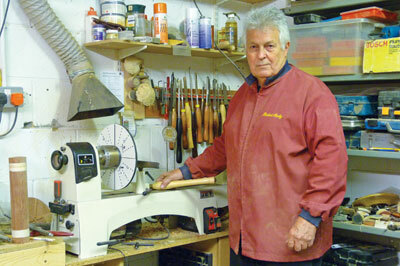 I love my woodturning lathe - Jet 1221vs with bed extension - but my favourite tool is the Robert Sorby RS200KT, which was a must-have after watching a demonstration. 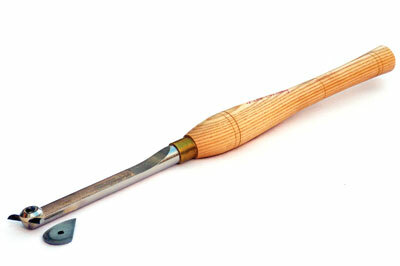 It is good for rapid wood removal on bowls and making sheared scraping cuts. To be more artistic instead of logical. My grandfather was an artist, so I should have the genes, but I don’t know what happened to them when they got to me! 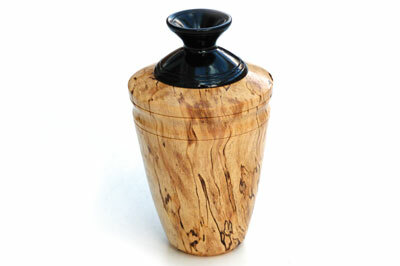 I mainly make bowls, dishes, boxes and no end of pens for sale for our chosen charity, but I need to progress on with different types of woodturning and that is why I shall be attending more courses in the future to try and bring some different aspects to my work. I really wish I could have more time to spend in my workshop and a good source of unusual turning timber other than the selection that is available at the usual woodturning stockists. I would really like a much bigger lathe, but space is at a premium in my workshop so until I have a good clear out, this will have to wait. I recently made a reversing Cole-type backplate to enable me to clean up the bottoms of bowls, etc. and this has been very useful - in fact, I don’t know how I made do without it!